Even though the state of Iowa is about as inland as you can be, it doesn’t mean that fresh fish isn’t offered in abundance at the different seafood restaurants found across the state. Whether it was caught in the Mississippi or flown in daily, there is plenty to choose from at Iowa’s best seafood restaurants, making multiple visits a must. To get a little help satisfying your seafood appetite, a good place to start are these 10 best seafood restaurants in Iowa. One of the premier restaurants in the state of Iowa can be found in the streets of Des Moines, and in the seats of Splash Seafood Bar & Grill. Splash flies their seafood in daily from major fish ports across the country, ensuring the freshest bite, and paired with their award-winning wine selection. Splash isn’t just one of the best seafood restaurants in Iowa, it’s one of the best eating experiences you’ll find in the state. Family-owned and operated, the original Waterfront Seafood Market opened to the West Des Moines public in 1984, and alongside this still-standing community staple, an additional storefront opened in Ankeny in 2008. Whichever one you choose to visit, you can expect to find an oyster bar, sushi bar, seafood market and a place to sit down, order food and stay awhile. Whether you pick something up to bring back home, or you enjoy any number of entrees offered by the Waterfront Seafood Market including catfish or walleye, you’ll be sure to satisfy your seafaring appetite. Featuring a full menu of lunch, dinner and Cajun options, Catfish Charlie’s of Dubuque has a lot to offer to say the least. From blackened grouper to po’ boy sandwiches, Catfish Charlie’s has something for every member of the family, including turf options to go with the surf. A high recommendation for any seafood lover, Catfish Charlie’s, and specifically the whole catfish entree option (lightly breaded and fried), will have you coming back for more after every catch. To get a great taste of the mighty Mississippi, go no further than Big Muddy’s in Burlington. Featuring a full menu of steak, chops, ribs, chicken and seafood, there are a lot of reasons to check out this 25-year-old restaurant near the river. Upon any visit, it’s always recommended to give the seafood a go at Big Muddy’s, whether it’s an appetizer or an entree, frog legs or top catfish fillet, and you’ll see for yourself why it’s a top seafood restaurant in Iowa. While it’s true that Sneaky Pete’s is a steakhouse, this world-famous restaurant also does a pretty great job at seafood, homemade salads and specialty drinks. Whether you come to Sneaky Pete’s to dine, or to wine, or to taste some great seafood, you’ll find something to enjoy in the fun atmosphere of this neighborhood steakhouse and seafood restaurant. Before or after your visit, the city of Le Claire offers the perfect environment to explore and really add to your eating out experience. 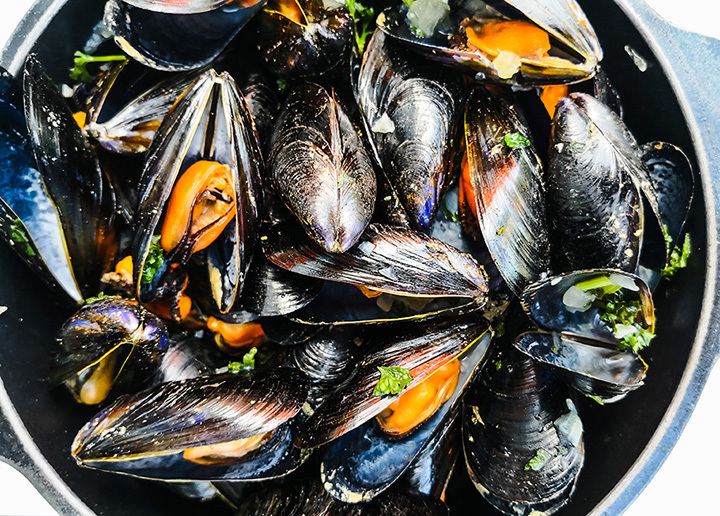 A local favorite for over the 30 years, Yesterdays in Arnolds Park is a seasonal seafood restaurant that can really add some enjoyment to your next lake Okoboji outing. Featuring a menu that almost exclusively caters toward a seafood appetite, Yesterdays is closed throughout the winter months, making summer the optimal time to try everything on the menu. Yellowfin tuna, Alaskan king crab legs and Greek tilapia, there is a lot to choose from at this lakeside eatery, making for just as many reasons to come back time and time again. Classified as casual dining, the Thunder Bay Grille offers a top-rated time with each visit. And with enough fresh seafood, certified angus beef and classic American dishes to choose from, those visits can always have something new. If you are in the mood for seafood, Thunder Bay has you covered with an assortment of entrees, all served up with a unique taste of flavor to enjoy. Whether it’s the seafood jambalaya or the fresh cedar planked salmon with a teriyaki glaze, you’ll be sure to find a new seafood favorite when visiting Thunder Bay Grille. Pull up a chair and dig into some of the best seafood around. Serving up crowd pleasing favorites like seafood eggplant pirogue and shrimp Gabrielle, one bite will keep you coming back for more. Stop by on a Thursday for $2 off appetizers and $2 classic can brews! Situated on the banks of the Iowa River in Coralville, the Iowa River Power Restaurant has been a community staple for over 30 years. In that time, they have built and developed a menu that can cover everyone’s needs. If you really feel like treating yourself to something special, it’s the Iowa River Power Restaurant’s seafood menu that really defines the experience. A great way to go every time is any of IRP’s surf and turf combinations or the pan-seared sea scallops, and you can’t forget the crab-stuffed shrimp, making almost too much to choose from with just one visit. Serving as both a seafood restaurant and specialty store, you can not only get a prepared entree at Cedar Valley Fish Market in Waterloo, but you can find something to take home with you too. Featuring an assortment of fresh fish to choose from, the Cedar Valley Fish Market has daily specials and bulk deals on all they have to offer. And while everything you choose will delight your appetite, the Friday and Saturday night all-you-can-eat Alaskan walleye is a great reason to visit.